​New US data published on Friday shows that the US economy in the year to the 3rd quarter of 2017 grew by 2.3%. In comparison China’s economy grew by 6.8%. That is China’s economy is growing almost three times as fast as the US. This is shown in the chart. ​​Some confusion in the media is caused by the fact that the official reports of China’s and US economic growth are presented in different ways. China emphasizes real year on year growth – that is China’s latest data, for 6.8% growth in the 3rd quarter of 2017, is a comparison to the 3rd quarter of 2016. As the same period in the two years is being compared no seasonal adjustment has to be made to the data.The US instead takes growth over the last quarter and compares it to the previous quarter – that is US growth in the 3rd quarter of 2017 is compared to the 2nd quarter of 2017 and the result is annualized. The strong disadvantage of the US method is that is relies on the calculated seasonal correction being correct. But it is well known that at least one of the US seasonal adjustments, that for the first quarter of the year, is seriously incorrect – resulting in reported US growth in the 1st quarter being seriously under reported, and that in the next quarters therefore being too high. Furthermore purely short term fluctuations can seriously affect a quarter by quarter adjustment. For this reason China’s method of comparing growth to the same quarter in the previous year is more statistically robust. 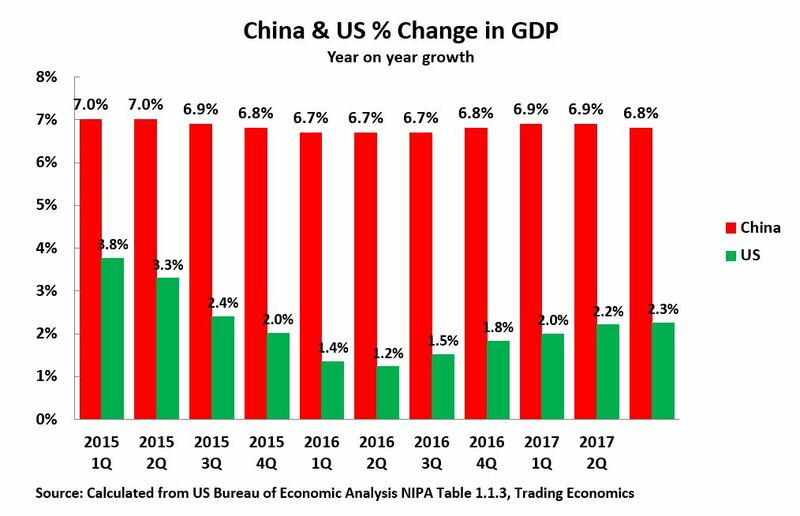 The data therefore confirms that China’s economy is growing almost three times as fast as the US.